Thanks for joining me on the blog Alex. First of all, would you tell me a little about yourself? I am a corporate person who spent twenty years climbing the ladder before being made redundant. 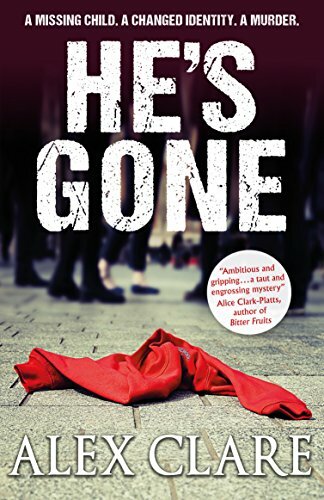 I had always found moments to write but now, with the extra time, I joined a writing group and, for the first time, other people read my fiction, which inspired me to start working on my second novel, which became He’s Gone. Now back at work, I write on commuter trains into London. I have written for a very long time, as it’s the most wonderful stress relief from normal life. Someone annoys you? You can arrange for something very nasty to happen to someone like them on your pages. What you don’t realise when you start is book is that the writing is the easy bit. What takes the time is editing. I was very lucky to have a range of supportive people to provide feedback on my work. I thought the draft was ready a number of times but then another pair of eyes will suggest something else that would improve it. I had a number of rejections from agents, mainly because they seemed not to like the character of Robyn, so I was delighted to be picked up by Impress Books. Seeing the steps to publication as they happen has been fascinating. It’s a crime novel about a transgender detective inspector who has to lead the search for a child snatched from a shopping centre on her first day back at work in her new identity. The title is meant to show the two threads of the story: the boy is gone from the shopping centre and the detective has left his old identity behind and is now Robyn. Yes, I’m working on the second book featuring DI Robyn Bailley. She’s now further into her transition, continuing to face challenges from those she encounters and with a new case to solve. I’m going to cheat and pick a trilogy. My biggest worry when on holiday is running out of books. When the worst happened, I ended up in an English language bookshop and picked up The Necessary Death of Lewis Winter by Malcolm Mackay because it was one of the few books that wasn’t a romance. It’s a crime novel, set in Glasgow, with a shifting pack of gangsters, hitmen, lowlifes and hangers-on. I enjoyed it so much, I had to find the other two books in the trilogy (When a Gunman Says Goodbye and The Sudden Arrival of Violence) and devoured them in a weekend. I like to swap genres between books so I’m now reading Kate Atkinson, A God in Ruins (Aug 2016). My main time for reading is just before turning out the light at bedtime. If I need an escape from the real world, I’ll find a book and go and immerse myself in it for a couple of hours. This is a tricky one because so many of the most memorable characters don’t have happy endings. One of my most-reread books is Far From the Madding Crowd by Thomas Hardy. Its heroine, Bathsheba Everdene, takes on a man’s world and has to go through trials and tribulations before finding joy. It’s a wonderful, intricate story and Bathsheba inspires us with her energy while also driving us mad when she lets her heart rule her head. I’ll be her.